Other than a few nights in which I've found myself looking intently but defeatedly at the half-empty glass of whiskey in front of me, I've been staring almost exclusively at Jason Oddy's photographs for the past two weeks. GNF first introduced me to his work a couple of years ago, and I had a brief email exchange with him regarding a photograph that I wanted very much to have in my possession. 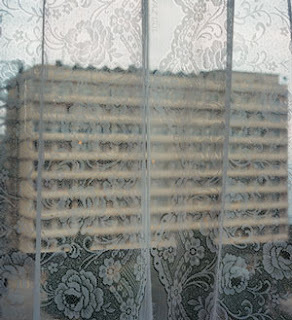 The image was of a rundown Soviet-era sanatorium, taken from inside the window of another sanatorium building; part of an entire series of photographs featured in a 2001 issue of Metropolis documenting Soviet sanatoria now falling into ruin, the photograph grabbed me immediately and fully in its interweaving of textures, colors, content, and elegiac, (false) memory-filled faraway-ness. Although the price tag was way above my then-graduate-student means (even with a friend-of-friend-discount), I haven't stopped dreaming idly about the image, and about Oddy's oeuvre in general. Now that I've found his website, I can't help but continually scroll through the images and sigh pretty much nonstop. 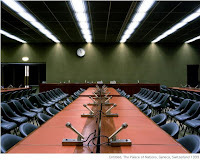 Oddy's work has taken him inside not only empty Soviet sanatoria, but also the UN headquarters in Geneva, Guantanamo Bay, the Pentagon, even the cluttered, unraveled homes of the recently deceased . Looking through his photographs, one is immediately struck by the absence of people -- of faces, movement, exchange -- of what we might understand or register as life. At the same time, these aren't landscape photos, or even photographs of places. Rather, these images compel a direct viewing of these spaces as place, as space constructed by and for humans, for life. And as such, they speak to the ways that space comes together to create, reflect, and perpetuate 'culture' in all the ways we might know and/or experience it. In his site, Oddy writes that "In the photographs .... I have treated architectural space as a cultural artefact, one which not only reflects but which also seeks to create historical reality." Seen in this way, the photographs feel less cold or removed than they seem stripped down to the basic questions of how space (or rather, the overt, conspicuous configuration of that space) dictates how we interact in those realms. And, across different projects, we can see overlaps in design -- how ideologies, regardless of content, similarly seek to impose order on its subjects, most fundamentally through the ways that the spaces they occupy compel specific kinds of interactions and daily exchanges. How ideologies, essentially, prescribe social relations. I could write about how Oddy's photographs are elegantly minimalist in their composition and colors, or how it just might be the case that he finds those spaces as-is, and simply has an amazing eye for capturing power or order, or its seeming absence, in their starkest, most essential states (and I do believe it's the case that both are true with regard to Oddy's talent). 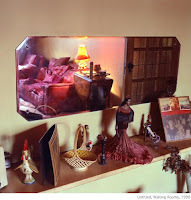 But there's something else at work here, something that makes these photographs entirely Oddy's, but also entirely ours, too .... And I think it has to do with the familiarity of it all, how we can imagine the kinds of relations determined these spatial configurations. How these settings bring power to life -- literally, but also figuratively, in the sense that they call our attention to the potency of architecture itself, and how we need not be in hallowed halls of multinational authority in order to experience the potency of constructed , designed space. The photographs depict, at heart, narratives of power, and how power in turn narrates the past, present, and future, in sometimes overt ways and in other instances through much more subtle channels. How it doesn't have to feel like power in order for you to be caught within it, organized by it. How power doesn't have to be an insidious, evil, demon-like cephalopod, its tentacles reaching everywhere, to nonetheless be present. And how that presence is immediately felt through its architectural manifestations. 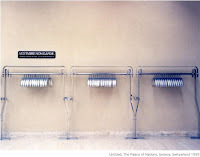 To be sure, I'm no Foucauldian, lets-intervene-in-the-ways-that-power-becomes- institutionalized-and-ritualized-in-daily-life sort of acolyte or anything. I don't think Oddy photographed these realms with a mind to present them as an immediate, always-already sort of critique of space and power. What is intriguing about Oddy's work is that in spite of its minimal, stark colors and tonal contrasts, there's still this strange nuance, this quiet trace, that one can find in all of these spaces. Their familiarity might have something to do with this feeling that, however removed they are from our own experiences, we can nonetheless sense that lived-in-ness. People become who they are in, through, and by these spaces, for better or for worse. "A number of the places I have photographed represent some of mankind's most far-reaching attempts to systematise the world. Yet here as nowhere else we see how all such attempts are inscribed with their own failure. Hubris makes us reach for Utopia. Reality, in the guise of time, sends us back ruins." 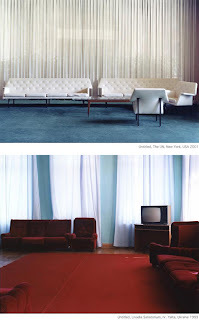 Oddy's Waiting Rooms series documents not ruins in the conventional, Roman-Empire-esque sense of the word, but rather the unraveling of architecture over time, an unraveling experienced on an individual level, but a ruin all the same. These spaces are not the endpoint of architecture -- I don't think that Oddy is necessarily suggesting through these photographs that all space comes to the same end, or that it comes to an end at all, or that we should look upon them as the future of, say, the Palace of Nations or the Pentagon. I think, rather, the contrast is between the attempt to systematise and the reality of living, of what it means to inhabit a space: the ruin is not in the decay but rather in the attempt at order itself; the endpoint of Utopia is the return to daily life. 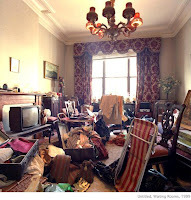 In the case of the Waiting Rooms series, depicting the cluttered spaces of the recently-deceased, that daily life continues: notice the depressions in the sofa cushions from years of wear, or the knick-knacks on the mantle, no doubt the accumulation of presents, souvenirs, and mementos over a long period. These objects reflect and inform our everyday existence, and become an integral part of what defines, for each of us, 'place.' There is little difference, in that sense then, between the painting of the fighter jet in the Pentagon conference room and the framed collage of photographs perched on the mantle. What stories do we want our spaces to tell? What kinds of narratives influence, and are then perpetuated by, current architecture and design? Oddy's photographs have got me thinking. A lot. But even more fundamentally, they've got me sighing. And, truth be told, desiring. I mean, these are spectacular photographs. If anyone would like to start a "Get HT That Sanatorium Photograph" fund, I wouldn't stop you. Ahem. * "...for somehow we know by instinct that outsized buildings cast the shadow of their own destruction before them, and are designed from the first with an eye to their later existence as ruins." this is just great, great stuff, ht. you're starting to daunt me. let's discuss over noodles in a bit. holy freaking beautiful. Thank you ht for showing me this. Of course I remember the first photo of the sanitorium (and agree with you that it is sublime), but I had no idea it was connected to this kind of vision. This is my favorite photography I have seen in a long time. When will he put out a book? I'd buy it in a heartbeat. Seriously, this guy should be famous. Also, might I say that this was a really nice piece of writing; it added a lot to the way I was thinking about the photos and was quite wonderfully written.